President Uhuru Kenyatta has sent a strong warning message to the opposition politicians in a televised message delivered from State House, Mombasa during new year. During his speech the President made a slight break from tradition of new year speeches and hit out at the opposition, accusing it of dishonesty. Kenyatta appeared to be targeting the three CORD coalition leaders who have previously called for mass demonstrations to oppose the elections amendment law that was recently passed by the National Assembly. Raila, Kalonzo, Wetangula plus other leaders int the coalition have since called off the street protests saying they are awaiting on the Senate to deliberate on the proposed law. “This is not opposition politics. 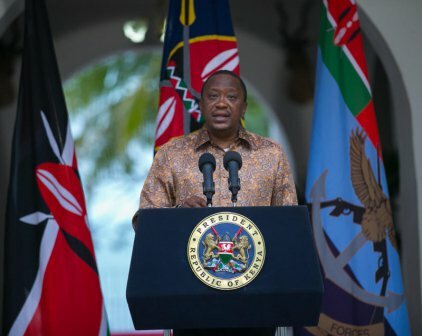 This is disruption and undermining of a country,” Kenyatta concluded. The president went on to assure Kenyans that the 2017 election would be peaceful, free, and fair, and called on Kenyans to support his re-election bid so that he could complete his developments projects.